Substance-using groups and identities may not be healthy and positive forces in our life, but people value them. Mapping such networks, and ensuring they are replaced, may be the key to behaviour change in addiction. In 1990 I arrived in London for a ‘gap year’, staying with some friends-of-friends for a few weeks while looking for a job and somewhere more permanent to live. I was young, far from my family and friends, and in those days before the advent of social media it was a lonely time. Everyone in the house smoked heavily. It was a shared ritual and a way of belonging. Soon – despite my knowledge of the health hazards – I became a smoker too. At clubs and parties that year, I would gather with ‘the smokers’, who always seemed to me to be the group having the most fun. I moved out of the shared house quickly but continued smoking – it took the place of a friend and something to do during a time of transition where I felt I didn’t belong. After returning home and back to friends, work and study, my smoking became something of a burden. There were no smokers in my family and I tried to hide it from my parents and colleagues who would no doubt have disapproved. Australian anti-smoking policies made smokers a stigmatised population. We paid increasingly heavy taxes on cigarettes and were forced to stand in smoking zones further and further away from our places of work and leisure. I noticed at parties that ‘the smokers’ group dwindled and instead of being the ones having the most fun, the smokers appeared to be the outcasts. Ironically, the smoking that had started as a way of belonging had become a barrier to connecting with family and friends. Eventually the day came when I realised that I was no longer one of ‘the smokers’ and I gave it up. Looked at through a social identity lens, my move to London brought about the loss of connection with several important social groups (family, friends, work). The identities that I drew from them (daughter, sister, buddy, scientist) became less salient. By taking up smoking, I gained an identity and a sense of belonging with a group of young people in the house. I conformed to the normative behaviours and attitudes of that ingroup (which included heavy smoking and drinking). I held positive group stereotypes of smokers – they were the ones having fun and living for the moment. However, after I returned home to my usual social networks and identities, my smoker identity was incompatible with the group norms of most of these valued groups. By the time I quit, losing my smoker identity was not difficult since I was a member of various other groups in which non-smoking was the norm. More recently, as a psychologist researching addiction, I wanted to know whether the need for belonging that had motivated me to start and later to quit smoking was apparent for other people who were addicted to alcohol and a range of other drugs. Together with colleagues Tegan Cruwys and Dan Frings in a 2015 study, we analysed interview transcripts from 21 adults in residential treatment for alcohol and other drug problems. These interviews provided evidence for two distinct social identity-related pathways into and out of addiction. The first was an identity gain pathway in which substance use and addiction gave otherwise isolated people a new social identity and sense of belonging (similar to my own smoking experience). However, other participants described how their previously positive social groups and identities (e.g. as a student, parent, worker) were lost when their addiction took hold – in ways that pointed to the existence of an identity loss pathway. For many, this loss was profound, such as marriage breakdown, loss of employment and loss of custody of their children. For this latter group, being a drinker or drug user was a negative identity with negative group stereotypes. Clearly, these pathways represent quite different social experiences for these two subgroups of people, yet both are motivated by the need to belong. It is also the case that when they come out of recovery the two groups tend to have quite different trajectories. For those on the identity gain pathway, recovery tends to be about forging new aspirational identities to replace their former substance-using identity, while for those on the loss pathway it is often also about picking up the pieces and reconnecting with previously positive groups. If people simply move away from their using groups and don’t join any new groups, they are vulnerable to relapse and social isolation. In the past 10 years, a growing body of research has helped to explain the role that belonging and identification with social groups play in determining our health and wellbeing. According to a social identity framework, people who are going through a period of transition tend to fare better if they maintain membership in multiple social groups and if they join new meaningful groups that are compatible with pre-existing identities. This is certainly the case for people going through life transitions such as retirement, moving from school into university, becoming a mother for the first time, or recovering from serious illness (see Haslam et al., 2018, for reviews). However, the story is more complicated when it comes to addiction. In this case, moving away from heavy substance-using social groups is a predictor of treatment success, because it allows people to see themselves less in terms of their addiction. It also makes them less vulnerable to social influence from groups in which heavy substance use is the norm. This process of social identity change is one that we and other colleagues have mapped out in the social identity model of recovery (see Figure 1, above). 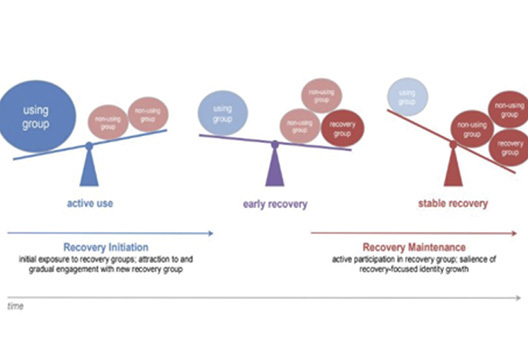 This conceptualises recovery from addiction as a process of social identity change, in which the balance of countervailing group forces changes over time. On the one hand, identification with, and hence the influence of, substance-using groups decreases; on the other, the acquisition of non-user identities provides alternative (healthier) sources of identification and influence. Illustrative of these processes in action, Sarah Buckingham and her colleagues studied 61 AA and NA members recovering from addiction in the UK. Their study, published in 2013, reported that the extent to which participants held a negative view of their addiction identity and a comparatively positive view of their recovery identity was related to lower relapse rates and reduced substance use. In a second study of 81 ex-smokers, preference for a recovery identity over a smoker identity was related to higher self-efficacy, and this in turn predicted lower likelihood that a person would start smoking again. In a similar study of adults entering a drug and alcohol therapeutic community (TC) in Queensland, colleagues and I measured how much people endorsed their identification with substance using peers; with others in recovery (at the TC); and with other non-users, at fortnightly intervals during treatment. We found that those residents whose identification with the TC increased within the first few weeks in treatment and whose identification with their substance-using groups reduced stayed longer in treatment (Beckwith et al., 2015). This is important, because retention is an early indicator of positive outcomes. We found that 64 per cent of the sample stayed the same or increased their recovery-identity ratings over the first month at the same time that 76 per cent of the sample decreased in user-identity strength over the first month in the TC. Speaking to the importance of these patterns for long-term outcomes, we followed up 60 of the original 132 participants around seven months after they left the TC and found that the extent to which they endorsed a recovery identity over a substance-user identity was a strong predictor of substance use and wellbeing at the follow-up point (Dingle, Stark et al., 2015). Moreover, this was true even after accounting for age, gender and substance-use severity at treatment entry. Among those with better recovery trajectories, then, it appears that recovery identity becomes internalised and stronger (more salient) relative to the user identity. This research has recently been replicated and extended in work that my colleagues and I have conducted with 307 adults entering treatment in one of five therapeutic communities in Australia as part of the Social Networks and Recovery project (Best et al., 2016; Dingle et al., 2018). At entry to treatment, participants’ substance user identities were very salient, rated 5.2 to 5.6 out of 7 on a commonly used measure of social identification. Again, though, after spending six months in the TC, participants tended to see themselves more in terms of a recovery identity and less as a substance user. And, after accounting for demographic factors and addiction severity, the difference between these identities at six months accounted for 8 per cent of the variance in treatment retention, 27 per cent of the variance in commitment to sobriety and 36 per cent of the variance in wellbeing. Various group and identity-related factors drive addiction and need to be understood and harnessed in treatment and recovery. Clinicians in alcohol and other drug-treatment services know that many people who seek treatment have tried to stop taking substances, often on multiple occasions, and then relapsed. This particularly tends to happen at the time when people leave treatment and return to homes and communities where heavy substance use is the norm. In this context, it seems that behaviour change and change in beliefs about substance use are most likely to be maintained when they are accompanied by social group and network changes that are aligned with and support non-problematic use. Our need for belonging is strong: we cannot expect people to lose valued substance-using social groups and identities unless we help them to replace these with other valued groups and identities. For some this means reconnecting with their former positive groups and identities (e.g. family member, friend, colleague, team player) – while for others, it means joining mutual support groups (e.g. AA, NA, and SMART recovery) or therapeutic communities in which a recovery identity can become a ‘transitional identity’ between the user and the non-user identities. Whatever direction the road to recovery takes, though, our sense is that social identities are always a major part of the terrain. Accordingly, much is to be gained by mapping this terrain and helping people traverse its most problematic features. Beckwith, M., Best, D., Dingle, G.A. et al. (2015). Predictors of flexibility in social identity among people entering a therapeutic community for substance abuse. Alcoholism Treatment Quarterly, 33(1), 93–104. Best, D., Beckwith, M., Haslam, C. et al. (2015). Overcoming alcohol and other drug addiction as a process of social identity transition: The social identity model of recovery (SIMOR). Addiction Research & Theory, 24, 111–123. Best, D., Haslam, C., Staiger, P. et al. (2016). Social Networks and Recovery (SONAR): Characteristics of a longitudinal outcome study in five therapeutic communities in Australia. Therapeutic Communities, 37(3), 131–139. Buckingham, S.A., Frings, D. & Albery, I.P. (2013). Group membership and social identity in addiction recovery. Psychology of Addictive Behaviors, 27, 1132–1140. Dingle, G.A., Cruwys, T. & Frings, D. (2015). Social identities as pathways into and out of addiction. Frontiers of Psychology, 6, 1795. Dingle, G., Haslam, C., Best, D. et al. (2018). Social identity differentiation predicts treatment commitment and retention in therapeutic communities. Unpublished manuscript, University of Queensland. Dingle, G., Stark, C., Cruwys, T. & Best, D. (2015). Breaking good: Breaking ties with social groups may be good for recovery from substance misuse. British Journal of Social Psychology, 54(2), 236–254.